The fridge is full of apples. Raincoat moves to the hook closest the door (waterproof shoes likewise). Quilt comes back out of the linen closet to cover the toe zone of the bed. Extra layers worn to Saturday Market and Club Mud (frequently forgotten there as the sun comes out around midday). Pottery production goes into high gear! 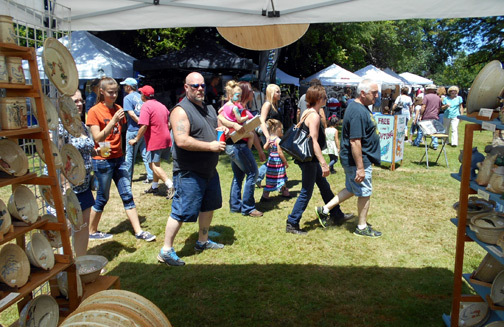 After a summer that includes jaunts up into Washington and down south to Roseburg, fall sales are closer to home: Fall Festival in Corvallis, Clay Fest in Eugene. But looming over the horizon in November are my biggest show of the year, Clayfolk (the weekend before Thanksgiving in Medford) and the biggest continuous run of sales, Holiday Market at the Lane County Fairgrounds in Eugene, which we join in progress Thanksgiving weekend and continue right to Christmas Eve. I've just unloaded a kiln to stock the first two sales; I'll need at least two more 50 cubic-foot firings to get me to Christmas. I just had a ton of clay dropped on my driveway last week. It's time to start making that into pottery. It happened again Wednesday night; Denise and I were unloading the big kiln while Nicole's class glazed their student work in the next room. She asked if it would be okay if they came in a few at a time to see the finished results, and I said "Sure," as it had been a good firing, and I'm always happy to show off my work. And of course, somebody asked, "Does your wife paint these?" My name is on the sign. It's on the business cards. It's on the price stickers. But at least once at every show, someone will come into the booth, look at the work, and ask Denise, "Do you make this?" Even more commonly, they assume that I throw the pots and Denise paints them. Why? I guess in our culture, painting just isn't a guy thing. Denise does assist with the technical end of the pottery. She always helps load and unload the glaze kiln, sometimes mixes glazes, occasionally rolls out dragon toes. 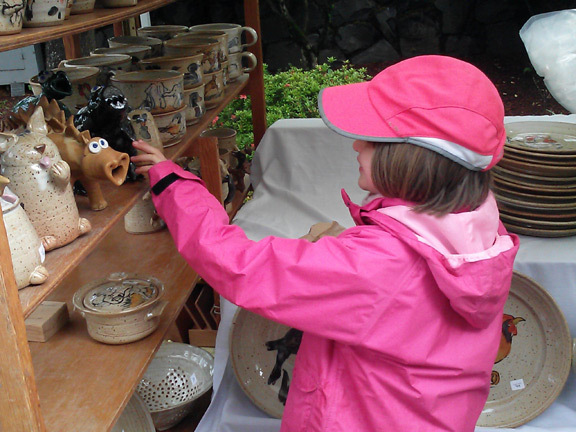 And of course she spends a lot of time in the booth, selling (or trying to sell) pots. Lest it appear that I only do the fun stuff, let it be noted that I also load and unload bisque kilns, the world's least rewarding job. 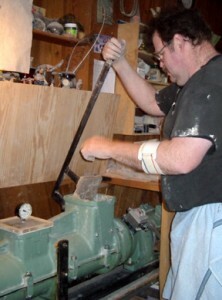 I also build and repair screens and equipment for Denise's handmade paper business, Pulp Romances. 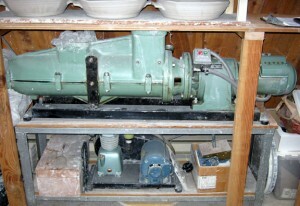 I run the dewatering press when she's teaching papermaking classes at the arboretum, or in the backyard. And I do a lot of computer work for Off Center Ceramics, Pulp Romances, and Braille Transcription Services, Denise's third hat. Processing, sorting and formatting the Oregon Country Fair performance schedule is no picnic. What I'm trying to say, I guess, is that our household is a family business, a lot like the family farm I grew up on, in that everybody takes a part. Someone milks cows, somone feeds the pigs, someone picks up eggs in the chicken coop. Everybody pitches in to make sure everything gets done. But I paint the pots. I was asked about shipping a casserole by two sisters at Clayfolk, so I promised I'd reprint this guide. From offcenter.biz, December of 2009. But how will I get it there? It's a common lament we hear this time of year. Someone's found the perfect present for Uncle Fred (or more often, Mom) in Minneapolis. But how to get it there? Space is your friend. The object of packing is to ensure that shock or impact from outside the package is absorbed before it reaches the object inside. To this end, 2-4 inches of non-compressible packing should surround your pot on all sides. Sadly, the best non-compressible packing is still styrofoam peanuts. I get them recycled whenever I can. (Cornstarch peanuts work too, but keep them dry. They shrink when wet. Mice will also eat them—and pee in the bag—so don't store them in the garage.) Air pillows work all right, but you'll still need peanuts to fill in gaps—leave no empty spaces. I shipped with honest-to-goodness popped corn one year. It worked all right, but compresses and settles more, and I burned out the air-popper in the process. Crumpled newspaper or excelsior does not work. It compacts in shipping, leaving your pot free to bounce around the box and do itself an injury. If you have more than one piece of pottery in the box, make sure they can't bump against each other. I usually make separators from scrap cardboard to keep each piece in its own little pen. Lids should be packed separate from their pots, or else wrapped in thin foam or bubble wrap and taped in place, so they can't bang against their base and break. Two boxes are better than one. For all but the smallest of pots, I recommend double boxing for shipping. Pick a second box about four inches bigger in all dimensions than the first. Fill the space in between with more packing materials. There's no need to wrap the box. My Grandma always wrapped her packages with brown kraft paper and twine. This isn't necessary, and can be a problem if the wrapper (with its mailing label) tears during shipping. If there's no blank spot to write the address, secure an address label with box tape right onto the box. To "Fragile" or not to "Fragile." While I have no evidence to support the rumor that shippers see "Fragile" stickers as a challenge, or worse, a bulls-eye, I suspect that they don't do much good, either. A potter friend who used to work holiday rush for UPS once told me, "When you've got 20 minutes to unload a 30-foot truck, you treat all the boxes the same. You can't slow down and carefully unload the box with the 'fragile' stickers." So count on your packing, not on the kindness of strangers. Where to ship? Your call. Parcel Post is cheaper, but UPS includes the first $100 insured in the price. I generally trust my packing and go with my friends at the River Road Post Office. If all else fails, let a pro do it. Your local mail center or UPS store will pack and ship it for you. Heck, we might even do it ourselves if you talk nice to us. Or bring cookies. You know that old joke--"Ask me what the hallmark of great comedy is." What's the hallmark of great com--"Timing." Timing is everything, this time of year. The end of the year, from October through Christmas, is a series of interlocking hard deadlines. Clay Fest was there, Clayfolk is here, Holiday Market is over there (and there, and there and there...). It takes me 4-6 weeks to make and fire a load of pottery, so I get two firings between Clay Fest and Christmas--and this is the one time of year where I can sell pottery as fast as (if not faster than) I can make it. Add in the fact that I fire at a co-op studio, so need to fit my firing schedule in with Jon's and Tea's, and things start to get complicated. And then there's the unexpected changes. I lose a day to a gallery-restock run, another to a mandatory meeting in Southern Oregon. Tea needs an extra day in his firing schedule; can I load a day early? I guess we'll find out. It doesn't help that after weeks of heat waves and forest fires, we're abruptly in fall weather: cool, damp, overcast when it's not actively raining. Everything in the studio is drying slowly, and taking it outside to dry in the sunshine only a fond memory. Then there's deciding what to make. Most of the year, I play catch-up. I start with a full inventory in April, then make pots to replace what's sold. I'll come back from a big show with a list of items with a month to make and fire them before the next show. That won't work now; starting in mid-November, I have a big show every weekend. Factor in Real Life interruptions--the insulation folks are coming in early November, so all the artwork must come off the exterior walls, all the furniture move in a foot. So much cleaning and sorting to do, most of it falling on Denise at the moment. So timing is everything right now. It's just time that's lacking. It's interesting, the assumptions people make. 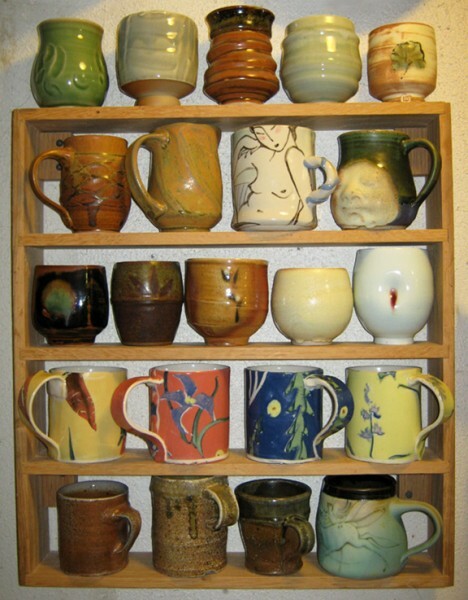 For example, they rarely ask me if I have other people's pottery in the house. In fact, they usually phrase the question in the negative: "You don't buy other people's pottery, do you?" The assumption being, I suppose, that I can make whatever I need, so why should I spend money on it? A visit to my kitchen cupboard is like a catalog of people I've met, studied with, occasionally taught over the years. People I admire, work I covet, stuff that I never in a million years would try to make. Some pots are particularly treasured, because the maker isn't around any more. I'll never buy another Chris Gum bowl, or Tom Rohr wood-fire cup. And that doesn't even go into the display case in the living room. Sure, I can make a plate, a bowl, a cup, a pot... but not necessarily that pot. That seductive soft porcelain tea bowl I bought at a rare sale from Michiyo Goble, with a pale blue celadon and just a tiny splash of copper red where it indents to meet my thumb. I'd never be able to duplicate one of Kathy Lee's covered bird pots, plump and tactile with the orange peel texture of a salt glaze. And I wouldn't even think of tackling the layered complexity of one of Craig Martell's slip-trailed and spray-glazed tea bowls. Don't get me wrong. I like my own pots. The forms are crisp and functional, and the paintings keep getting better. Rare is the firing that doesn't have something in it I can't part with. But I love other people's pots as well, for the form, for the glaze, for the notion that I might learn something about my art from how someone else approaches it. That's one reason I love to go to shows like Ceramic Showcase, or Clay Fest, or Clayfolk. They're great places to sell pottery, of course, but also to network, catch up with potter friends from around Oregon and southwest Washington, pick up some tricks at the demonstration stage. And to buy pots. I rarely come home without some new treasure for those very full cupboards. 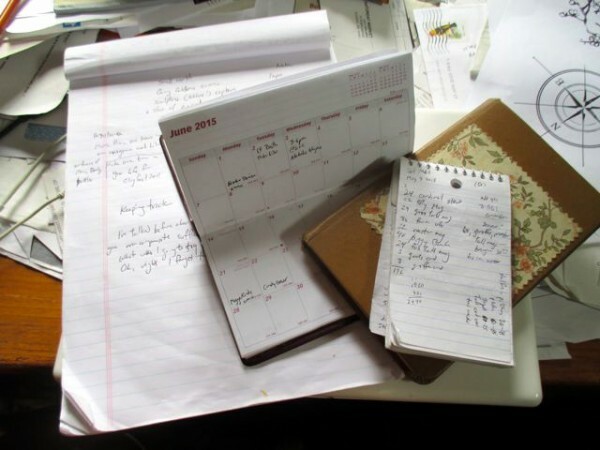 I've talked before about how, with sufficient overcompensation, disorganization can seem organized. Today, a similar topic. Oh, right. I forget things. Not consistently, not always. I have a capacious memory for trivia. Book plots, song titles and lyrics, stuff I learned in school years ago, are all ready to pop up in the front of my brain at a moment's notice. Last week's promise, or next week's deadline: not so much. As with my lack of organization, I have coping strategies. Write it down. I keep a bunch of different notebooks: a kiln log where I record each step of every firing, with notes about what went wrong or right, gas usage, timing. I'm trying to get better at including the results as well, but since the kiln unloads two days after the firing ends, I don't always remember to bring the log book. A pad that lives in the Market cash pouch, where we record sales, make note of restock needs, and record name and contact information for any special orders we take. I also still carry a pocket calendar, on paper, to record appointments and deadlines, though I'm not as good at using it as I once was. Denise remembers dates better than I do, and I've gotten spoiled. I try to salt my location with legals pads as well--in my backpack, in the studio, at Club Mud. When I don't have one handy, I'll resort to small scraps of paper with cryptic notes that live in my wallet until I've gotten around to deciphering and filing them properly at home. Get it in writing. Email has been a huge help to me, because I can get very detailed specifications, information from people on what they need in an easily archivable form. (I also cc myself so I know what I promised in reply.) Phone messages are also helpful, but still need to be transcribed and saved somewhere. Know where to find it. This is crucial. Loose phone messages, notes from my pocket, things left on my desk, disappear. Oh they're there somewhere, buried in the strata. Unless of course the cats have slid them onto the floor, where they disappear into Denise's strata. So I have to be systematic. The first step was to buy a file cabinet. I've got a drawer for household papers, another for business, with labeled folders for important topics. More recently, I've started filing things on my computer, specifically by creating "Special Order" files. They consolidate information from phone notes, Market pad and emails into an easily printable form, with products, patterns names and contact information. And they're dated by glaze firing so I know which one is current, and where to find older ones. That's the nice thing about multi-gigabyte hard drives: you never have to throw anything away. Right now I've got two current spOrder files in the documents folder, one for miscellaneous small projects, another for an eight-place table setting bound for Tallahassee with a choice of thirty-two different patterns. I'll need to make one more before I start glazing, for a complicated multi-image, multi-plate project that's currently detailed in about a dozen emails. As the outdoor art fair season winds down, a look back at summer from July 2014 at Off Center Ceramics. It's the morning of the third day of the second weekend of out-of-town art fairs, and I find myself reflecting on the view from the booth. We don't see much of the rest of the fair, mostly sleepy vendors unzipping canvas tents, or exhausted vendors closing up again at the end of the day. (Maybe one in a hundred is disgustingly bright and chipper at 8 am; morning-person artists are unnatural.) In between we're too busy in our booth to get out and about much. You're here to see the sights, occasionally to be seen. We're here to manage the store and--hopefully--sell some pottery. In between, we people watch. 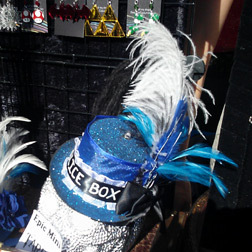 Costumes are a big part of some shows' culture. 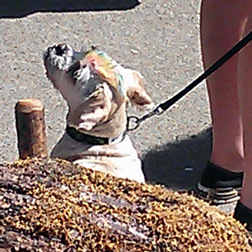 Or lack thereof: the naked bike ride at Fremont Fair brings a lot of body-painted, well, bodies past the booth. Or into the booth--it's a challenge being professional to browsers wearing only an airbrushed coat of his-and-hers gold and silver body paint. Others are less extreme: a group of silk kimono-clad women with bamboo and paper parasols strolled past yesterday. A lone bagpiper circulates through the crowds, serenading us with martial tunes. A little girl in bright blue dress and butterfly wings shows them off for a passing photographer. Clusters of teenagers are fun to watch, kitted out in whatever is current fashion in their milieu. Goth used to be ubiquitous; now hipster and retro are taking over, with a strong sub-set of steampunk. Matching obscure t-shirts are a couples thing--what is it with the Bill Murray in beard and stocking cap? I've seen several. Occasionally we'll see something really outré, like the girl in manga-inspired geisha (or maybe ronin) ware sewn from Batman-print fabric. Carrying a sword. T-shirt watching is another entertainment. My favorite this fair? Ask me about my ADD. Or cake. I like cake. What day is it? I just saw a tree. Hi. On really slow days, we play Hair of the Day. So far at this show, it's a toss-up between a little boy with a wavy blue and magenta mohawk and a grandmother with an orange crop and gold highlights. Roseburg is tame compared to Eugene. On a given Saturday afternoon, we'll see six or eight real contenders, and once the hands-down winner was a toy poodle with a rainbow mohawk. But ideally, we're too busy to do more than just glance. Talking to browsers, handing out business cards. Selling pots and restocking from the boxes in back. Catching up with old friends, making new ones. Commiserating with neighbors who're doing worse than we are, envying those doing better. Quietly, though. You never know when the wheel's gonna turn. And planning ahead. Stressing about what we should have brought, wondering what's in the shed at home. Making lists of things to make for the next firing. And always, thinking ahead to the next show. Do you remember the scene in Fiddler on the Roof where everyone is fluttering about the "new arrival" at Motel and Tzeitel's house? The crowd finally parts to reveal Motel showing off his new treadle sewing machine—while a still very pregnant Tzeitel walks in from stage left. Well, this is our new arrival: a Venco 4-inch de-airing pug mill. It mixes and screens recycled scrap clay and runs it past a vacuum pump to remove air bubbles before extruding a nice smooth cylinder ("pug") of clay. Tricky, too. Venco is an Australian brand, and half the bolts were metric, half English. A few were also corroded tight. Fortunately for me, my neighbor is a retired log truck driver with some big power tools, including an impact wrench that finally did the trick. How does it work? Well, we're still working on that. We've run it twice so far, and the mixing and extrusion parts work fine, the de-airing not so much, possibly from air leaking in through the side seams. If we can get them tightened up, there ought to be vacuum pressure. I'm thinking duct tape. From the Off Center website, September 2007. It's really Kathy Lee's fault. 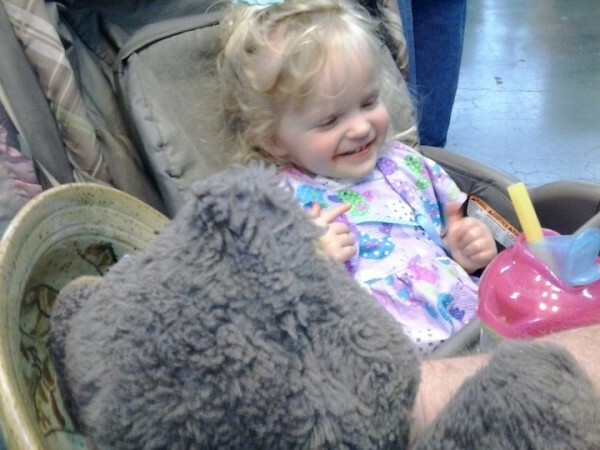 The yellow bear, that is . We shared a Saturday Market booth, our first few years trying to sell pottery. Her booth, actually, and her tables, chairs, table covers. I provided the sign. After three years trying to interest the stroll-by public in her tiny, exquisitely crafted pots, Kathy gave up on Market in favor of galleries and holiday studio sales. I inherited the booth frame, built some shelves to go with it. Kathy kept the sign, but I kept the bear. I thought he was awfully cute, you see, a good match for the "Whimsical" in "Whimsical & Functional Stoneware." 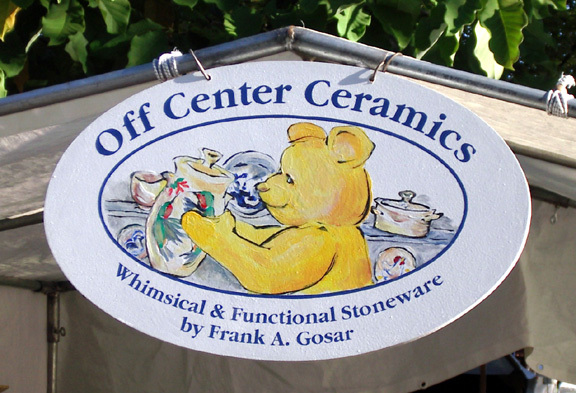 Besides, we'd already started bringing teddy bears with us to Saturday and Holiday Markets, so when I painted a new sign for Off Center Ceramics, the bear stayed. Holding a cat bank. Fast forward ten years to 2007, a Thursday afternoon in Seattle. We're setting up for our third out-of-state show in as many weekends. We're very tired, kinda cranky, and have gotten really bored with that particular stretch of Interstate 5. And I can't find my sign. Well, the whole weekend went about as you'd expect, with that kind of beginning. We felt naked without our sign, anonymous. Customers were few and far between, and it rained most of Sunday. It was an omen, I tell you, a sign of the craft gods' displeasure. Now that we're back in Eugene, I've retraced my route from our driveway to the point where Beltline joins I-5, over in Springfield. No sign of my sign. I'm very much afraid that it's been crushed to flinders out on the blacktop somewhere. Fortunately for me, I still had the template for the lettering stencil on my computer. The University of Oregon Craft Center had some nice half-inch birch plywood in my price range, and let me cut a new oval on their very nice bandsaw. Paintbrushes were on sale at the UO Bookstore, and wonder of wonders, I had half a can of primer and all the paints I needed. And if you're reading this website from somewhere on the north I-5 corridor, and you've seen an oval wooden sign that says "Off Center Ceramics, Whimsical & Functional Stoneware" with a yellow bear, get in touch. Unless it bounced off your windshield at 65 mph, in which case I'd rather not know. Brought to mind by today's discovery, a reminiscence from the Off Center Ceramics website, circa June, 2006. We had a couple stop by our Saturday Market booth this last weekend, very pleased to find us. 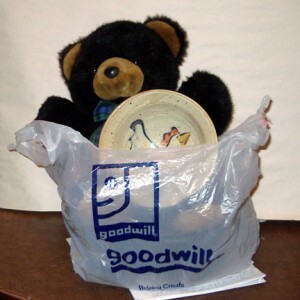 Seems they'd picked up one of my bowls at the Goodwill store, and were delighted to find where they could get more. I've heard stories from other potters, of course, tales of finding their precious creations in yard sales or thrift stores, callously marked down to fractions of a dollar. But this was the first time it had happened to me. Denise did her best to reassure me. She was certain, she said, that the original owners were moving somewhere far away, the East Coast, maybe, or Australia, and were heartbroken to have to leave their precious bowl behind. (Active imaginations seem to run in our family, have you noticed?) And at least they'd donated it to a good cause. Ah well, I can get behind donating to a good cause. We're cash-poor, but creativity-rich here, so every year I find myself donating pots to fundraisers for charities ranging from church to schools, Catholic Charities, St. Vincent de Paul, wildlife rehabilitators and chimpanzee sanctuaries. This June, Food For Lane County's Empty Bowls sale included at least 75 soup bowls we donated, as well as serving bowls for their on-line silent auction and fall fundraiser. So I'm glad Goodwill got a little boost out of my lonely pot. 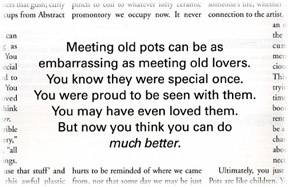 I recently published an article in Ceramics Monthly about those ugly old pots from one's beginning potter days that somehow, against all odds, find someone who treasures them. It's only fair that the reverse is sometimes true as well. But it's a relief to know that somebody found this unloved pot and is giving it a second chance.